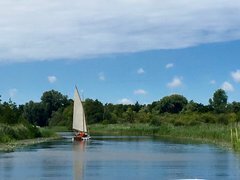 Step onboard one of our self drive day boats or canoes and experience the magic of the wonderful Norfolk Broads. Take a picnic, stop off at a pub or simply tour the rivers - whatever you choose to do you can be sure of a great day out. Our boats are well maintained, clean and easy to handle and if you have never driven a boat before we give comprehensive tuition before you cast off on your adventures. Your safety is of utmost importance to us and all passengers will be issued and fitted with a bouyancy aid. The boats are open plan, seat up to seven people (dogs are welcome) and have a retractable sunroof and removable canopy so that you can enjoy the river no matter what the weather. 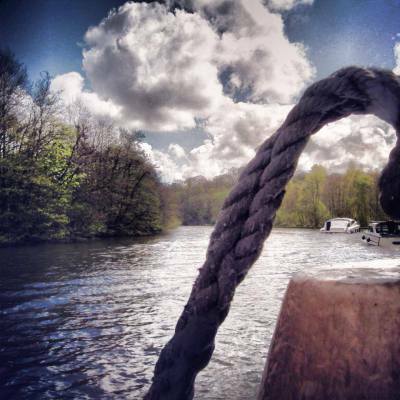 We have a choice of diesel or electrically powered boats too - so just let us know your preference when booking. If you fancy something a little more sedate and peaceful why not hire one of our three seater canoes? You can explore the waterways at a much more leisurely pace and can often get up closer to the wildlife, as without the noise from an engine they don't often even realise you are there! You will be issued and fitted with a bouyancy aid and a paddle is provided. Not sure where to go? Our friendly and knowledgeable staff will be able to point you in the right direction. 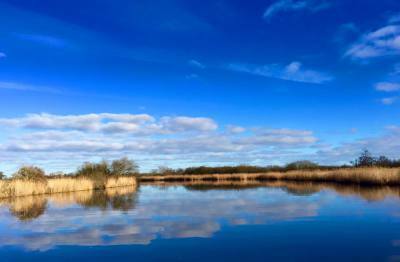 Short cruises are ideal to visit the beautiful Barton Broad, where it is believed that Admiral Lord Nelson learned to sail or visit the bustling market town of Stalham just a short trip away from our base. Looking for peace and maybe a pub lunch? Make your way to Neatishead and walk to the White Horse Inn from the moorings. Cruise south and stop off at How Hill with its beautiful gardens and Broads information centre housed in Toad Hole Cottage where you can also see how a marshman and his family would have lived. For longer trips travel to the River Bure which will lead to the pretty Broads village of Horning where there are several pubs, shops and a delicatesen. The waterfront homes and gardens are a wonderful sight as you travel at 4mph. 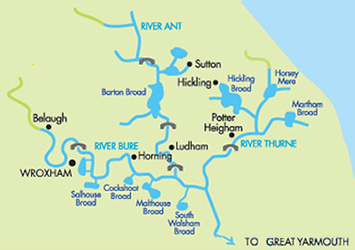 Continue further along the river and stop off at the beautiful Salhouse Broad or visit Wroxham which is known by many as the capital of the Broads. Here you can find the famous Roys of Wroxham Department store. There really is so much to see and the choice truly is yours. Relax and enjoy!